Originally presented at IDWeek in San Francisco, October 3-7, this poster demonstrates the value of MultiPath technology for addressing important drawbacks of current infectious disease diagnostics. See the results of a technical study demonstrating the potential of the ultrasensitive MultiPath technology to deliver rapid, accurate, easy-to-use test for C. difficile toxin B. Originally presented at 2018 ASM Microbe. 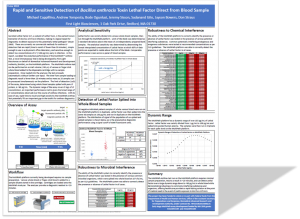 Originally presented at ASM Biothreats- February 12-14, 2018 Baltimore, Maryland, this poster shows the results of Anthrax testing through the MultiPath platform.